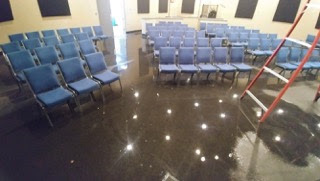 Our church auditorium was flooded on Friday evening. Someone drove into a nearby fire hydrant releasing water into the alley behind our auditorium. 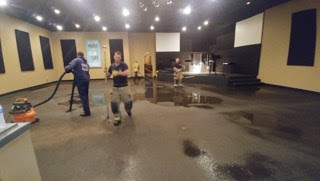 This water damaged our church facility, and we believe, several other businesses in our business park. Sunday services will take place, but we’ll be making due with what may be a damp and disheveled auditorium. We’ve engaged a company that specializes in clean up efforts. They are helping drying out the building and assessing damage. It’s very likely that we’ll need to replace and/or repair carpet, the stage, drywall, etc. But we won’t know the full extent until a team comes in on Monday to more closely examine the water damage. They will also coordinate the repairs that must be made. It’s likely that the auditorium will be a work in progress for the next several weeks. We want to thank the Corona Fire Department for responding to the situation and for helping to remove excess water from the auditorium. Also, special thanks to our church members who came to assist and support. We ask for your prayers as we deal with this damage. Pray that God will glorified, that the auditorium will be quickly repaired, and that will we keep our focus on Christ during this time.